Samsung Galaxy J4+ and Galaxy J6+ were launched in India on Saturday, just days after their global unveiling earlier this week. The highlights of the two budget smartphones are their 6-inch Infinity Displays with 18.5:9 aspect ratios. The two also sport the same battery capacity - 3,300mAh - and the same processor - Snapdragon 425 SoC - but otherwise, their specifications are quite different. The phones come with Dolby Atmos audio tech, and the company is touting Widevine L1 certification for HD video playback. The South Korean company has also brought an Emotify feature with the smartphone, allowing users to utilise avatars on messaging apps and social media, in 22 Indian languages. "Galaxy J series is India's most popular smartphone series, making up almost a third of all smartphones sold in India. We are making the J series even more exciting by introducing many features such as Side fingerprint, Emotify, Install Apps on SD Card, Glass finish and striking new reflective colours. Galaxy J6+ and J4+ are just what today’s millennials are looking for in their smartphone – supreme style and unmatched performance," said Mohandeep Singh, Senior Vice President, Mobile Business, Samsung India. The Samsung Galaxy J4+ price in India has been set at Rs. 10,990, and will be available in Black, Blue, and Gold colour variants. 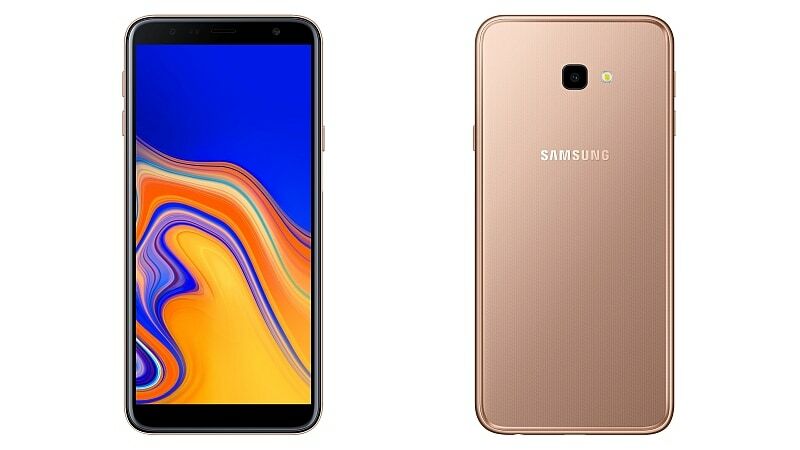 The Samsung Galaxy Galaxy J6+ price in India on the other hand has been set at Rs. 15,990, and the smartphone will come in Blue, Black, and Red colour variants. Both the Galaxy J4+ and Galaxy J6+ will be made available to buy via Samsung India's retail outlets, as well as Amazon, Flipkart, and the Samsung Shop online stores, from September 25. As a launch offer, Samsung is discounting its one-time screen replacement Offer to Rs. 990 until November 11. The Galaxy J4+ runs Android 8.1 Oreo out-of-the-box, and sports a 6-inch HD+ (720x1480 pixels) Infinity Display with an 18.5:9 aspect ratio. The handset is powered by a Snapdragon 425 SoC, coupled with 2GB of RAM and 32GB of onboard storage. In terms of optics, the Galaxy J4+ bears a single 13-megapixel rear camera sensor with f/1.9 aperture, coupled with an LED flash. On the front, the smartphone gets a 5-megapixel selfie camera with an f/2.2 aperture. Samsung Galaxy J6+ runs Android 8.1 Oreo, and sports the same 6-inch HD+ (720x1480 pixels) Infinity Display with an 18.5:9 aspect ratio. The phone is powered by a Snapdragon 425 SoC. It also comes with 4GB of RAM and 64GB inbuilt storage.